Gerard David was probably born in Oudewater. After his training in Haarlem, he establishes himself in 1484 as master in Bruges. David is the artist who summed up the 15th Century, the century of Jan van Eyck, both technically and contentwise, and at the same time already stood in the 16th Century. With the mysticism, a religious disposition for the secret and concealed, and the special attention to the landscape, he belonged with Geertgen tot Sint Jans. In addition to this, Gerard David is indisputably influenced both by the Italian Renaissance as by the ‘Flemish' masters such as Memling and Van Eyck. Gerard David played an important role in the evolution of the landscape paintings that in the beginning of the 16th Century evolved to a self-standing genre under the influence of Joachim Patinir. Gerard David is probably born around 1455 in Oudewater in the vicinity of Gouda. His birthplace is known because it is mentioned on his tombstone in the Bruges Our Blessed Lady Church. His grave disappeared at the beginning of the 19th Century due to restoration work. David painted The Nativity (Metropolitan Museum of Art, the Friedsam Collection, New York) probably before he settled in Bruges. The composition and the quotidian, simple personages show influences by Geertgen tot Sint Jans and Dieric Bouts. The KMSKA in Antwerp is in possession of two side panels (The Virgin, St. John and Three Mourning Women and Pilate and the Jews on Golgotha) which constitute a triptych with Christ Nailed to the Cross from the collection of the National Gallery in London. Gerard David becomes freemaster-painter in the guild of the visual artists and the saddlemakers in Bruges. Legally, Gerard David had to have been at least 25 years old at that time. This is the first documented trace of his career path. David paints Salvator Mundi (Metropolitan Museum of Art, Robert Lehmann Collection, New York). This small work shows a very human Christ. Originally it was an illustration in a book of hours. The theme comes up often for Bruges books of hours from the late 15th Century and early 16th. David paints St. John the Baptist and St. Francis Receiving the Stigmata (Metropolitan Museum of Art, The Friedsam Collection, New York). They are the side panels of a triptych from which the middle panel probably depicted a crucifixion or lament. The combination of both saints is unusual in the Low Countries. Both of these early panels clearly show the influence of the Ghent Altarpiece by the Van Eycks. David is chosen in February as second founder (governing member and assistant to the dean) of the guild. It is his first official function. After the death of Hans Memling, David takes up residency in a house in an artists' district near the Vlamingbrug, where Memling, among others, had lived. The house remained in his possession until his death in 1523. He paid burghers' rent (a supplement to the sale price) to the hospital of Our Blessed Lady of the Potterie. Between 1494 and 1510 he shared his home with a certain Antheunis Huyghe. Gerard David is elected first founder of the guild on 2 September. David paints the St. Michael Altarpiece (Kunsthistorisches Museum, Vienna) as an evening altarpiece. David produces the Crucifixion (Metropolitan Museum of Art, Rogers Fund, New York). The work gives witness to his attention to the landscape and was intended for private devotion. It exhibits influence by Memling. The city of Bruges pays David for the completion of a work for the Deputy's Courtroom in the Town Hall: ‘large painted panels, situated in the Deputy's room'. 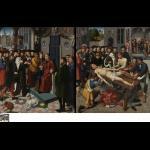 This deals here with the two large panels with the Judgement of Cambyses from 1498 (Groeninge Musuem, Bruges). It was the British archivist James Weale (1832-1917) who linked the appropriate archival documents to these two preserved panes. In this way, Weale brought the work of David back from obscurity. The remuneration took place after the city magistrate had asked the judgement of four people, amongst whom was treasurer Jan de Trompes. De Trompes ordered from David in 1502 the Altarpiece of the Baptism of Christ (Groeninge Museum, Bruges) as central. Gerard David is again first founder of the guild. David paints the Transfiguration (Church of Our Blessed Lady, Bruges). The work is expanded with side panels by the hand of Pieter Pourbus. Gerard David is named as dean of the guild on 12 October. David paints the Canon Bernardino de Salviatis with St. Bernardinus, St. Martin and St. Donatian for the St. Donaas Church in Bruges (National Gallery, London) where the Salviatis canon was. This work was the left panel of a diptych. The right panel is The Crucifixion in the Gemäldegalerie in Berlin. David paints the Mystic Marriage of St. Catherine (National Gallery, London). On commission of the city treasurer Jan de Trompes, David makes the Altarpiece of the Baptism of Christ (Groeninge Museum, Bruges). On the side panels stand the commissioner with his first wife and their children portrayed in the company of their patron saints. On the outer panels stand a married couple with their daughter portrayed, also accompanied by her patron saint. The detailed rendering of the nature is of utmost importance for the development of the landscape as a self-standing genre. In this period there are irregularities in the payment of the rent for his house on the Vlamingbrug. This strengthens the suspicion that David was active outside of Bruges for longer periods of time. David realises two side panels with the Annunciation (exterior) (Metropolitan Museum of Art, Robert Lehmann Collection, New York) and tableaux with Christ Carrying the Cross (the Crucifixion and the Resurrection, with the Pilgrims of Emmaus) (Metropolitan Museum of Art, Robert Lehmann Collection, New York). Once again, it was the British archivist James Weale who attributed the side panels to Gerard David for the first time. The dating is based on comparative research with the signature of the Altarpiece of the Baptism of Christ (Groeninge Museum, Bruges). It is generally accepted that the middle panel is the Mourning, which is in now found in the Philadelphia Museum of Art (Johnson Collection). David is at the apex of his career. His well-intending behaviour with respect to the wishes of his clients secures for him many assignments from Italian diplomats, bankers and merchants. 7 September 1506 is the probable date of the commission for the monumental Cervara Altarpiece for the Benedictine Abbey near Genova (disassembled and dispersed when the cloister was broken up in 1799). The commissioner is Vincenzo Sauli, a banker and diplomat from a wealthy Genovese family. It is taken that David made a second, short trip to Genova to assess the situation on site. The multi-panel with seven panels came to be in Bruges and is one of the strongest pieces in the oeuvre of the artist. Gerard David, without paying the member fee, becomes member of the presitigious Cofraternity of the Blessed Lady of the Dry Tree, proabably likewise as much in the hope for projects as for his spiritual purity. The fact that he was accepted shows his high social status. David paints Virgo inter Virgines, a large altarpiece on panel. 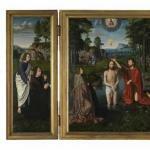 It exhibits Italian influence, in addition to the influence of Van Eyck and Memling. The artist and his wife, the moneyed Cornelia Cnoop, daughter of a goldsmith, stand there portrayed heraldly correct as a couple. David thus must before 1509 have been married. He gifted the work to the Carmelite Sisters of the Sion cloister in Brgues. It was placed on the high altar. The panel was mentioned in an inventory from the cloister in 1537 (it is still found on the high altar) and in a letter from 1771 by the hand of the lector of the cloister. In the letter, there is mention of another work by David on which he depicts the family of the donor. Virgo inter Virgines is his only documented work and the only one that can be attributed to David with 100% certainty. During the French administration taken away and was to be found in Rouen. (Musée des Beaux-Arts, Rouen). David painted Rest on the Flight into Egypt (Metropolitan Museum of Art, The Jules Bache Collection, New York). It is a pioneering work in which he integrates the sfumato, or the artistic effect of fading and flowing into each other. David paints the Nativity triptych (Metropolitan Museum of Art, the Jules Bache Collection, New York). The exterior panels (Mauritishuis, The Hague) show something completely new: a patch of forest without people. David realised the Virgin and Child with the Milk Soup (Aurora Trust, New York and Palazzo Bianco, Genova). With this work and tems as the Rest on the Flight into Egypt, David plays on the wishes of the public that more attention is to be given to the context, rather than to the religious theme. David paints Virgin and Child with Four Angels (Wrightsman Madonna) (Metropolitan Museum of Art, Charles B. Wrightsman, New York). Worth noting is the presentation of Mary in a Bruges environment, with the St. Jacob's Church, the Our Blessed Lady Church and the indication of the cloister of the Carthusians in the background. The source of inspiration for this work was the Madonna at the Fountain (Royal Museum of Fine Arts Antwerp) by Jan van Eyck. Presumed date of origin for the Adoration of the Magi (National Gallery, London) and of the Portrait of an Augustian Friar (?) Praying (National Gallery, London), which is portrayed against a city view of Bruges. This work was probably the right panel of a diptych or triptych. David was concurently a member of the Antwerp St. Lucas guild with Joachim Patinir. Their motives were purely commerical: in this manner he was equaly present on the steadily, increasingly more important Antwerp art market as on the Bruges market. It is equally unlikely that he also rented a studio in Antwerp. Gerard David fought out a difference before the court with the painter Ambrosius Benson from Lombardy, who had lived with him as a colleague. David was ruled to be in the wrong, but he ignored the court ruling. In January 1520, David was placed in prison at the request of Benson. The family of the provider of assignments Jan de Trompes gifted the Altarpiece of the Baptism of Christ to a more publicly accessible chapel in the St. Basilius Church (Holy Blood Chapel) in Bruges. Gerard David and his father-in-law fought out a difference before the courts with the architect who had carried out the renovations on his father-in-law's house. That same year ihe is involved in another legal case, and he receives a heavy fine. From the archive documents it appears that Gerard David owns a house on the Dijver and possibly inhabits it himself. That could be the explanation for the fact that David is buried in the Our Blessed Lady Church. Gerard David settles an old debt with the Carmelite sisters of Sion shortly before his death. He dies on 13 Auguts in Bruges. His wife does not pay his death debt for the guild of the visual artists but that of the libraries (book illustrators). In art historical circles, recently an agreement is growing over the fact that David at an early point in his career must have worked as a miniaturist. Gerard David is buried under the tower of the Our Blessed Lady Church. He is survived also by an underage daughter, Barbara. Meester Gheeraert David Scildere (Master Gheeraert David Painter) is inscribed in the death register of the guild of the visual artists and saddlemakers of Bruges.